Landing somewhere between mid period Jandek, Scott Walker’s reading of Tennessee Williams’ Blanket Roll Blues, and the soundtrack to a David Lynch film is the mysterious artist known as LEWIS and the album he christened, L’Amour. Breathing the same rarified air as such 1980’s private press oddball geniuses like Bobb Trimble, Stan Hubbs and Jeff Eubank; Lewis is almost more question mark than man at this point with the ethereal L’Amour, his inadvertent calling card. Barely released in 1983 on the unknown R.A.W. record label, it was uncovered in an Edmonton flea market and from there it began its second life, culminating in a reissue on the venerable Light In The Attic label in 2014. 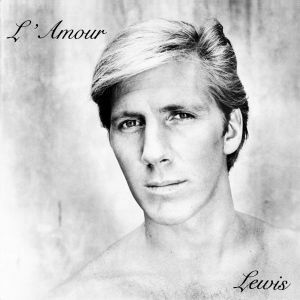 L’Amour boasts a sort of delicate monochromatic beauty, much like the striking cover photo of Lewis (taken by L.A. punk rock photographer Ed Colver and paid for by the artist in question with a rubber check). The music is stark, spare and at times quite moving. The album boasts a clutch of skeletal, barely-there compositions, with a piano or guitar providing the foundation and accompanied by a sometimes warbling, or sometimes prettily droning synthesizer. Then there are Lewis vocals – a sad, strange, soulful voice that at times sounds like he’s either mumbling, half remembering or improvising lyrics. Album opener “I Thought The World of You” starts things off on a down note and it doesn’t really let up. From there, the record segues into the creepy folk-blues spider walk of a tune “Cool Night in Paris.” L’Amour continues to build and swell as each track flows into the next, as if each track is really part of one larger song cycle. Slightly past the mid point is the icy, new age instrumental coolness of the cosmic “Summer’s Moon.” The album closes with the melancholy “Romance for Two,” which seems to mine the same soaring and boring singer-songwriter mope of an alternative universe Runt-era Todd Rundgren or perhaps some lost Carole King demo. Perhaps Lewis was just bummed that either his stock portfolio tanked and his white Mercedes got repossessed or that he is never going to be able to repair his spaceship to get back to his home planet. We might never know, since as of the time of this writing, despite the label’s full efforts to turn him up; Lewis remains in the shadows. Isn’t it almost better that way? PREORDER the LP from Light in the Attic – black and clear vinyl pre-orders available ! Posted on June 19, 2014 June 19, 2014 by the13thtrackPosted in LP, Reviews, Throwback ThursdayTagged ambient, ethereal, folk, L'Amour, Lewis, Light in the Attic, Reissue, Throwback Thursday.